This book presents physical-layer security as a promising paradigm for achieving the information-theoretic secrecy required for wireless networks. It explains how wireless networks are extremely vulnerable to eavesdropping attacks and discusses a range of security techniques including information-theoretic security, artificial noise aided security, security-oriented beamforming, and diversity assisted security approaches. It also provides an overview of the cooperative relaying methods for wireless networks such as orthogonal relaying, non-orthogonal relaying, and relay selection. Chapters explore the relay-selection designs for improving wireless secrecy against eavesdropping in time-varying fading environments and a joint relay and jammer selection for wireless physical-layer security, where a relay is used to assist the transmission from the source to destination and a friendly jammer is employed to transmit an artificial noise for confusing the eavesdropper. Additionally, the security-reliability tradeoff (SRT) is mathematically characterized for wireless communications and two main relay-selection schemes, the single-relay and multi-relay selection, are devised for the wireless SRT improvement. In the single-relay selection, only the single best relay is chosen for assisting the wireless transmission, while the multi-relay selection invokes multiple relays for simultaneously forwarding the source transmission to the destination. 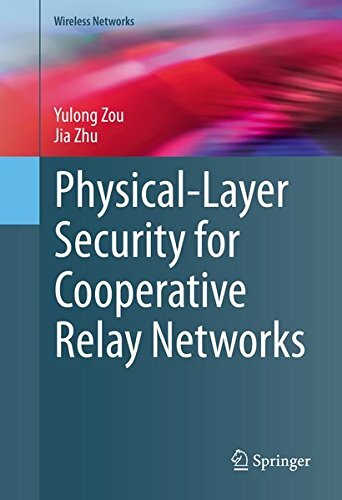 Physical-Layer Security for Cooperative Relay Networks is designed for researchers and professionals working with networking or wireless security. Advanced-level students interested in networks, wireless, or privacy will also find this book a useful resource. About: This book presents physical-layer security as a promising paradigm for achieving the information-theoretic secrecy required for wireless networks.